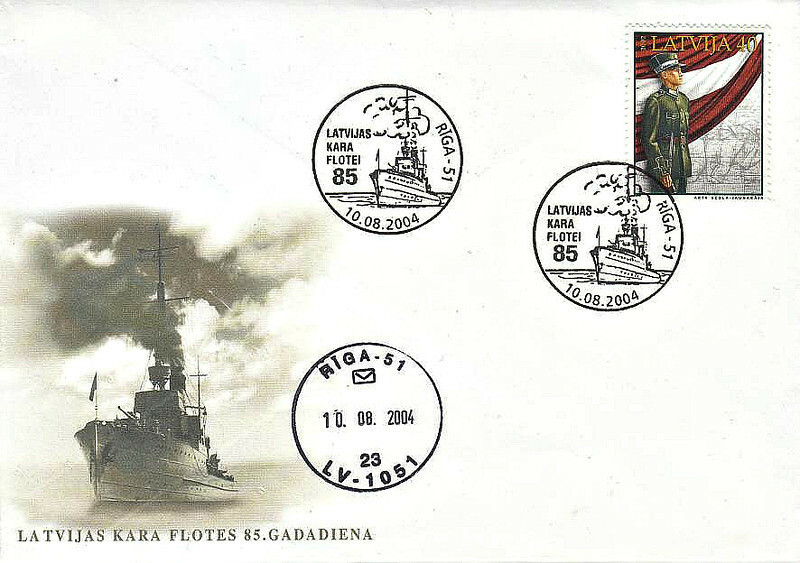 Latvia, only an independent nation between the two World Wars, had a very small Navy - 2 submarines, 1 gunboat and 2 minesweepers. Independent once again, the modern Latvian Navy is somewhat larger. These pictures are published for pleasure/information/research purposes only and are not for sale or copy under any circumstances. Information in captions has been researched as thoroughly as possible but it accuracy cannot be guaranteed. 1921 to 1941 - VIRSAITIS - Gunboat, ex-German M57 Class Minesweeper M68 - 525 tons - 55.9 x 7.2 - 1917 Neptun AG, Rostock - 2x2.9in, 1x2pdr - 17 knots - 29/10/17 sunk by mine at Dunamunde, 11/21 salvaged, reconstructed at Riga - First Day Cover to celebrate 85th Anniversary of Latvian Navy.